What Tinder, Grindr and Co can teach us about sourcing? A good friend of mine, an exceptionally talented young sourcer, let’s call him Bobby Curaçao, is present on almost each and every dating site. Well, these are not websites, as I was corrected by Bobby, but mobile apps with usually no (or not too developed) desktop applications. Who knew? It is, as he calls it: true love straight into your pocket. Anyway. We are not here to talk about love (and btw you should never talk about love, as Bobby often reminds me, ha!). It all starts with that super-long journey: taking those pretty uncomfortable extra miles on planes, in taxis, queuing here and there sometimes for hours, those thousands of foreign faces you randomly meet while getting lost in time zones, languages and emotions. The feeling of cold and hot in the same time. And then… welcome to Dallas! This all puts your excitement on fire. You are super exhausted but extremely excited to see all the things that will be happening with and around you the next days. You do it for a purpose: you need to live through that experience, to try and immerse into the deepest life of a SourceConer. You know that lifestyle exists but don’t know yet what is that all about. living on the planet. You are immediately welcomed, you are IN and with your badge you have got your life-long ID to this large, crazy but lovely family. Your secret Twitter list containing those very best sourcing and recruiting legends here suddenly goes live. Sourcers must be the greatest liberalists on Earth. And then you join the conversation. SourceCon is not anymore the forum of geeks only. This is probably the widest range of all-type practitioners: researchers, sourcers, recruiters, leaders and so on. Buyers and providers. Everyone is involved; everyone has got to do something with sourcing. Sourcing is the reality of recruiting. You are amazed by the diversity of the definition of sourcing. No one agrees. Not even clear what we mean under the word ‘sourcer’. This can be a lead-generator, or someone that runs engagement, too, working only with ‘passive candidates’ (does that exist at all?) or to manage the entire candidate generation funnel, all channels… There is no one receipt. But there are success stories (and challenges) on all sides. Hey! this is the best in all of it: this kicks off passionate discussions, warms up arguments, widens your thinking horizon, challenges your “written-in-stone” statements, your beliefs. This is an evolutionary thing and we are, I think, somewhere in the middle. No need yet to agree but we all do it, I believe, to get closer to a universally accepted definition. Time will come. Sourcing is still a new profession and this is how we all form the content of that. Every contribution (even the smallest one) counts. For me, this is the very mission of SourceCon: it makes the community build and define and set up the basis (the ultimately agreed basis) of this new profession. By listening to the great Shannon, you understand that sourcing is not that complicated. Basically, sourcing is simple. No, I would not say easy but sourcing is something you can learn and develop into. Do not only focus on tools but sharpen your logic, make the necessary shift in your mindset, get the approach – or hire good sourcers! But who is a good sourcer? Well, this is what I think about it, but you’d rather first ask the question from yourself: what do you want them to achieve? What do you want them to be accountable for? It’s been a recurring theme on SourceCon this year that how we should measure sourcers. Certainly (see above) there is no one solid solution but probably the most important take away is that be most consistent. If you make your sourcer generate only prospects you may not want to measure them against making hires. Understand the sourcer’s input in the entire recruiting value chain and build the right expectations and measurement around his deliverable. Your lead-generator sourcer’s only deliverable is making highly qualified leads. Nothing more but nothing less. If then the one who will convert these leads into candidates is happy with the quality of leads that’s where and what your sourcer should be credited for. Do not try and make them become responsible for anything else as they have got zero control over the rest of the procedure. Understand that recruiting is a chain of constant decision making activities and the one that makes that particular decision in the process can only control and be accountable for that step. Otherwise, you set your sourcing team for ultimate failure. And based on many of us experience, this failure is coming on longer term – you won’t probably spot it right at the beginning. Listen to us! No, you want your sourcers to be accountable for hires, right? Well, then build the set around them to be able to control that. Give them every candidate (including applicants, referrals and those directly sourced ones, too) to manage so that no one else but they will be making the only decision around which candidate will be moved into the funnel. This is the only way to build hiring-close responsibility to your sourcers – think about it! Is it what you want to achieve? You make that decision. 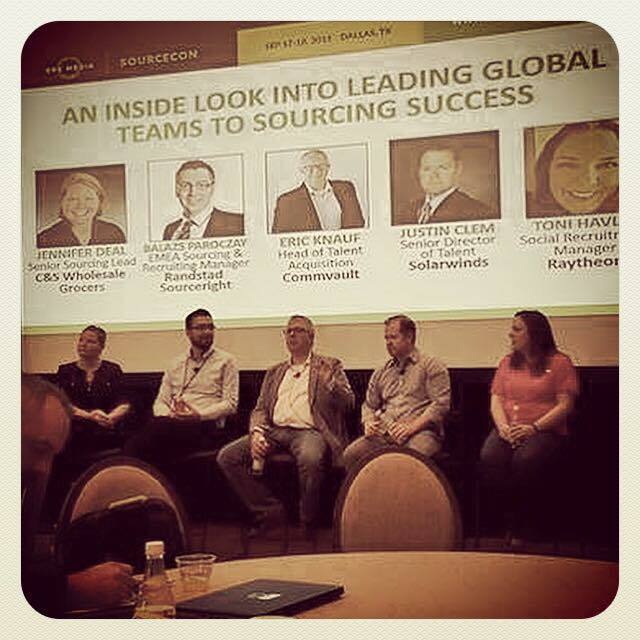 Interestingly, and this is my final reflection from SourceCon this year, there is still little discussion around how to improve the sourcing delivery. The conversations I joined were trying to get to this point from a recruiting perspective by placing the sourcing delivery into the end-to-end selection procedure as one action, one process step. This is somewhat understandable but bear in mind that you’ve got to understand all the sub- and micro-steps and actions your sourcers are doing during their very own procedure. That is the only place where you will find the key to bring in efficiency and improvements to sourcing: are they mastering at searching? can they engage well? using the right messaging? is there a need to bring in new technology, training? etc. As long as you only see the numbers at the two ends of the funnel (# of candidates added to the long-list and # of recruiter interviews) you will have little insight on what to change in the sourcing engine. It is gold and, I think, the only logical next step to evolve our profession. Spend quality time with your sourcers to understand the nuances of their sourcing procedure. This is how you will be able to not only manage but lead your sourcing team. This is how you will most integrate sourcing into the end-to-end recruiting cycle. And how you will get there to see the extremely best impact sourcing can make in your business. Long live to SourceCon and all the ones around! Thanks for this superb experience! Two-and-a-half years ago I joined Randstad Sourceright to build a world-class sourcing centre to cover the Europe, Middle East and Africa region. That time, early 2013, we had nothing yet in place but a strong ambition to build a brand new, unique and highly value-add service line, the so-called Centre of EMEA Sourcing Expertise (aka #rsrsrc), and to bring in and spread the love of all things of sourcing within Randstad and its clientele. Nothing shows better the infancy of a profession (professional field or domain) than the lack of in-depth discussion and argument around its basics. Think about all the new recruiting sciences such as big data, candidate experience or so: thousands of practitioners are echoing each others’ thoughts without providing less than little value and real expertise on the bottom line. This is of course the case with sourcing, still, today. Too few experts really understand what and what not sourcing is. 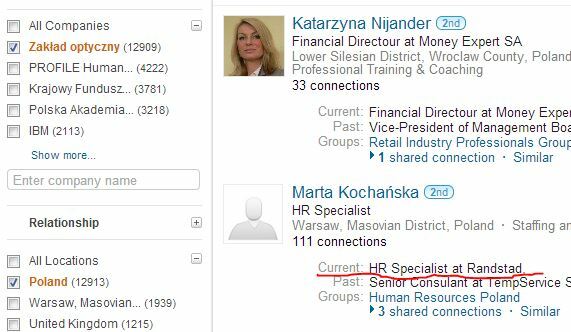 I wanted to see which company had the most LinkedIn members in Poland (Hungary or Czech) so I used these location filters and went to ‘All companies’. In Poland, it is a company called ‘Zakład optyczny’ with more than 12K employees and that – as I do not speak Polish – sounded like such a nice, large and decent local firm.